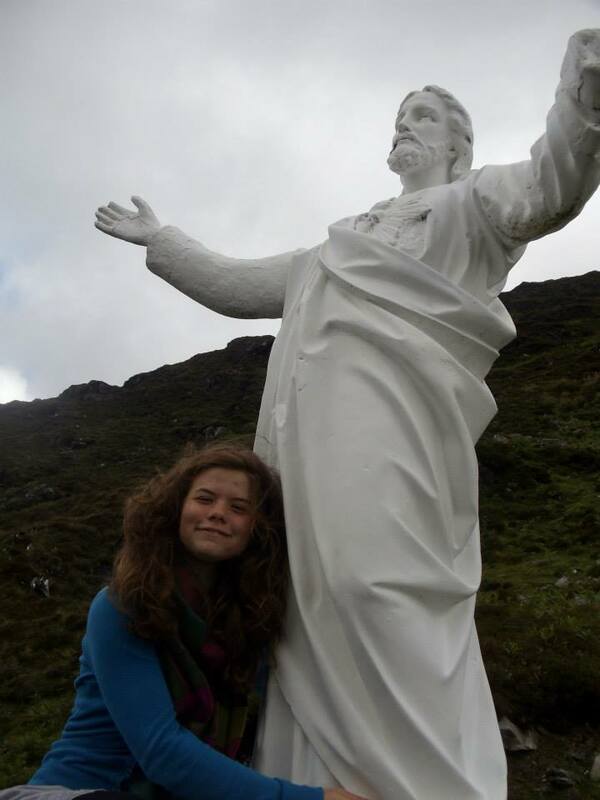 Jennifer Ashwell poses with a statue of Jesus sitting atop a mountain in Ireland. Schlep Away… Ireland is Waiting! I would be lying if I said schlepping myself and my possessions about three thousand miles from Baltimore to Connemara was not a hassle, because it was. Like most great movements though, it was also worthwhile. Before the morning of my departure, I was determined to spend the car and plane rides smiling, freely wondering about my destination, and feeling grateful, but I did not. The night before liftoff, my dad suggested that rather than drive me from Penn Station to Newark Liberty International, as he had promised to do months earlier, he would buy me a train ticket. I came to peace with the idea of fighting city traffic to get to an unfamiliar station where I would have to search for my train, when he told me the tickets were so expensive that he had to drive me. After the car ride with my loving, but aggressive dad, I know what that high price covers:  calm driver,  calm ride,  quiet, moderately comfortable seat. At the airport, I saw members of my group and joined their bag-check line. I waited twenty minutes, because they had been successful, but overheard a man behind me complain that his flight had been delayed, and realized the line was now only servicing customers with delayed flights. Once in the correct line, I met Relief, also known as Ann Cooper, who was the travel agent for my group. She welcomed me kindly, helped me print my tickets and lift my less-than-fifty-pound suitcase onto the conveyer belt. At this stage, I just had to wait. I had to wait through security lines. I had to wait for boarding. I had to wait for liftoff. Six hours later, I waited some more on a bus ride. The flight gave one of my group members an earache, and the bus ride made another nauseous. Luckily, I made it to Kylemore Abbey relatively unscathed. 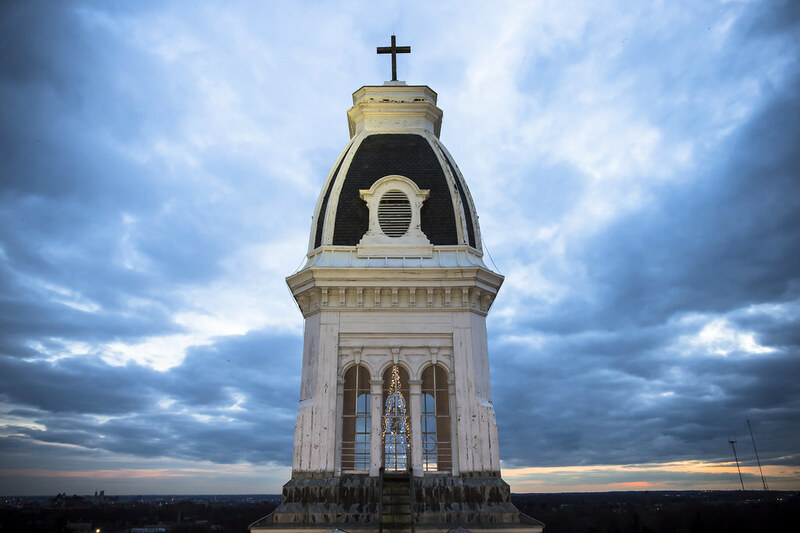 One of my professors once told me that the fate of many college students is to schlep, and that as a student he spent many weekends schlepping his books and records from his home in New York to campus, and back again. When he told me that, I remember having felt a little sorry for myself and my fellow students, but I was only seeing half of the situation. I think to be alive is to schlep, to carry yourself, your beliefs, passions, and that book you have been meaning to finish with you from one place to another. It’s not always easy and you risk forgetting trinkets, getting sick, or even losing yourself. Still, you also are giving yourself the chance to find new treasures, meet new people, and grow. The transition from Baltimore to Connemara was not all smiles and positivity, but it allowed me to make new friends, stroll silently through the woods arm-in-arm with people I love, and see sheep hanging around a statue of Jesus atop a mountain. To miss my two weeks in Ireland because the transit was a bit of a struggle would be a tragedy. My recommendation? Schlep away! Your arms may be tired now, but your heart will be thankful later.